Divine ! bright and very nice Studio apartment with a spectacular terrace-patio with deck. It was recently redecorated with great taste. It is located on the Barrio Norte one of the most commercial area of BA. The apartment has a living room with a sofa , table and chairs for two.. The bedroom has a queen size bed. The kitchen is very modern and it has all the amenities. The bathroom is very nice with shower. 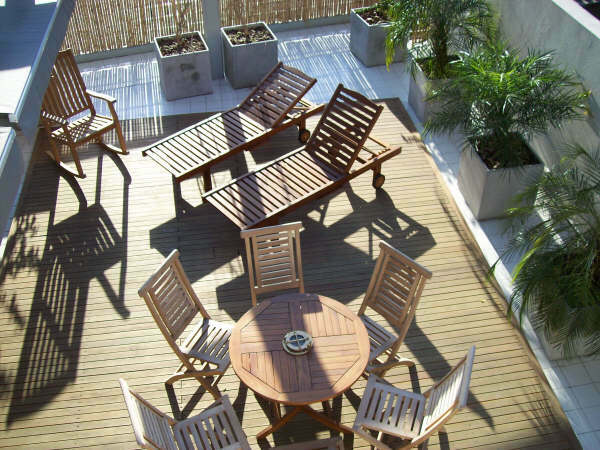 Terrace with deck . AC warm/cold. Internet High Speed. Wi Fi . Kitchen fully equipped with gas cooker, oven, microwave, refrigerator, freezer, coffe-machine. Washing/dryer machine. Bed linnen and towels. Cleaning service once a week. Brand new building, swimming pool for summer season, sauna , gym . Elevators .